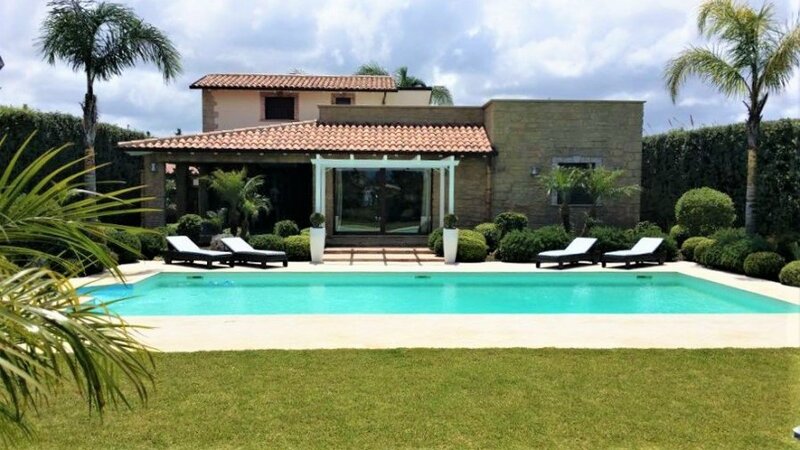 Villa Ares is the ideal place for those who love comfort and look for a place to find peace and relax. From the terrace you can admire fantastic sunsets over the sea, the beach is 800 mt away. The villa’s strong points are the garden, the salt water Jacuzzi corner in the swimming pool and the large porch where you can dine outside and enjoy moments of true peacefulness. The villa is on two levels, all the rooms are well kept, well-furnished and characterized by large and bright windows. You enter inside from the large and bright living room overlooking the garden and the pool. The living room is organized in two areas, lunch and conversation. The kitchen, cheerful and bright, is equipped with all appliances (coffee machine, kettle, toaster, microwave, four-burner kitchen, oven, fridge, freezer and water dispenser with drinking water) and it is completed with a breakfast corner that allows you to fully experience the location. Inside the hall, a comfortable staircase leads to the first floor where the three bedrooms are located, each of them with private bathroom. The garden, with lawn and ornamental plants, is furnished with modern and elegant furniture. A comfortable outdoor bathroom with shower is at the service of the pool. An additional covered veranda with outdoor kitchen features a wood-burning oven and a functional barbecue. Villa Ares is located in Trappeto, a lovely town not too far from Palermo, the capital of Sicily. The nearest beach is called by the locals "Tre Piscine" (the three swimming pools) because of the particular shape of the sandy coast.